Vacation Week! I have in the past been fairly disciplined about working out during vacations. However, given the state of my knee, I was concerned about running four or five days in a row. I was unsure of any available gym, bike or suitable pools for swimming. OTOH, giving the knee and frankly the rest of my tired old bod a rest might be just the thing. Sunday afternoon, after riding 60+ miles with Terry, the family headed to Glen Rose. We stayed at the excellent Best Western, which was really a very nice property. I had a nice run on Monday morning around the back roads of Glen Rose. Then we spent the day swimming in the Paluxy River. And after that we drove down to New Braunfels. Tuesday we spent the day in tubing the San Marcos River. Wednesday we spent the day at Schlitterbahn. Thursday Erin blew in, and it rained like hell. The perfect day for a trip to a cave. With all of that I did not get motivated to do any workouts! Friday we drove back to Dallas and I managed to get a swim in at Lifetime. Saturday I rode with the RBM ride and this time I managed to get dropped several times, but I also caught back up at least four times. I hung with the group longer than ever. Terry and I rode this morning. He needed a short ride, and good thing, because my legs were dead! The knee is not healing very fast, although it does seem to be doing better. That said, I don't think I would be comfortable running the Tri-Rock with the knee in its current state. Predictably the run on Monday hurt worse than the run on Friday. Saturday I did the RBM ride again but unlike last week, after I got dropped I did not have the energy to get back in the pack. Still I logged more miles and I should mention that it was 100 freaking degrees outside! Sunday I headed out with Terry and Kambiz for two loops of White Rock Lake. My legs were dead, but I survived the ride and racked up 130 miles for the weekend! Monday Aug 6 - 35 min run; 4.3 miles. 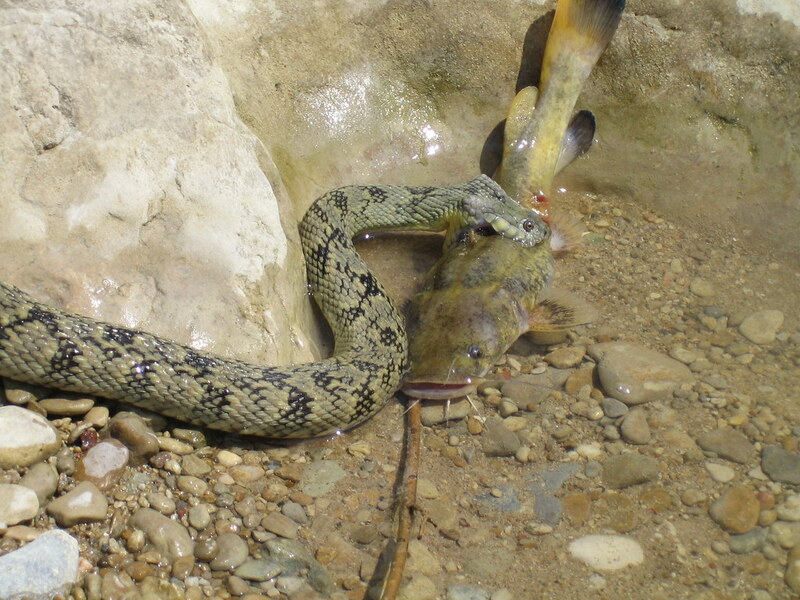 I went to Dinosaur Valley State Park and watched a snake eat a catfish! July was a good month - really I peaked perfectly for track and still got in lots of quality Swim and Bike work! Monday July 30 - 35 min run; 4.3 miles. This week really built on last week in a number of ways. First, and most importantly, the knee is healing. I am not limping around anymore. But range of motion is still bad and it hurts when I run and to a lessor degree with swimming and biking as well. I have continued to build on my Situp, pushup, pullup, chinup and hip PT stuff exercises. Saturday I got up earlier and rode with the Plano Cycle Nuts, and then did the 905 ride. I got dropped again, but this time I took a shortcut and got back in the pack! Sunday August 5 - Solo ride around White Rock Lake - 53.1 miles; Speed 17.4 Ave 29.4 max; CAD 89; Ride Time 3:03. Last year I sprained my left MCL. I think this happened when I jumped into the pool at The Dennison Dash Triathlon last September. The knee has been sore since then, and of course running is the thing that most aggravates it. Apparently I sprained it again - probably during last weeks 1500. I spent this week barely able to walk, much less run. The range of motion for that knee is severely limited. Anyway no problem, on my run days, I just hit the lifecycle. Friday I did 30 minutes running as well. Also new for this week I finally joined Bob, Tom and Mary at Loos Natatorium instead of Lifetime for Tuesday Swim. Loos is a Long course (50 meter) pool. Half of it is also a diving well and its REALLY DEEP! Like it must be 30 feet deep. Its pretty freaky! :-) The other thing that I started back with this week are my hip PT exercises and lots of situps, chinups, pullups and pushups. And one more thing! Saturday I did the RBM 905 big dog ride for the first time in a while. Then Sunday I doubled up and rode to White Rock Lake with Mike Jones. Monday July 23 - 30 min lifecycle 9.5 miles.